This is indeed one Heavenly Hideaway and formerly known as such. Name changed to Moonlight Lodge in March 2017. Easily accessible with a fully paved road and driveway leading up to it, you will find this serene retreat tucked into a secluded area, offering plenty of privacy, peace and quiet. And as you sit on the back porch, gazing out at the mountains on a clear night, you will know just where the “Moonlight" part of this name came from. This spectacular cabin feels open and airy due to sky-high, angular ceilings and spacious rooms. Professionally decorated in rich color palettes, each room feels sumptuous and inviting, with custom hardwood floors, high-end appointments and beautiful, nature-themed accents. Rise and shine and witness a truly awe-inspiring sunrise with a Mimosa in hand, celebrating the day before you. Reflect on the many ways you can spend the day, perhaps hiking or biking in the hills nearby, heading to the river for a day of fishing or tubing, or simply relaxing at this peaceful mountain haven. Whether it’s a hot breakfast or a three-course dinner, the main floor’s open plan allows you to make meals in the gorgeous kitchen and not miss a beat, as everyone enjoys each other’s company, gathered around the stone gas fireplace, the kitchen island or nearby dining table. There’s plenty indoors to keep kids of all ages entertained. Downstairs in the game room, spend the evening sharpening your pool skills or playing foosball or Xbox 360. Watch a movie or catch up on your favorite shows, or simply curl up with a book on one of the cozy sofas with a glass of wine. Step outside and you’re instantly immersed in the splendor of nature. Lounge on a rocker on one of the two large, covered wraparound porches with a cold drink, taking in heavenly mountain views. Treat everyone to kabobs on the gas grill and have dinner outside on the dining table. Enjoy a cool fall night with a soothing soak in the hot tub or pull up a few chairs around the fire pit. Every bedroom will invite you to a heavenly night’s sleep. In the master king bedroom upstairs, step out on to the covered private balcony and breathe in the crisp, cool mountain air as stars twinkle in the heavens above. Have a bubble bath in the master suite’s Jacuzzi tub to unwind before bed. You can also choose the king bedroom on the main floor, two XL twins in the bedroom on the lower level that do have wheels that can be pushed together and the kids can snuggle in to the trundle bed and twin bunk beds on the lower floor as well. 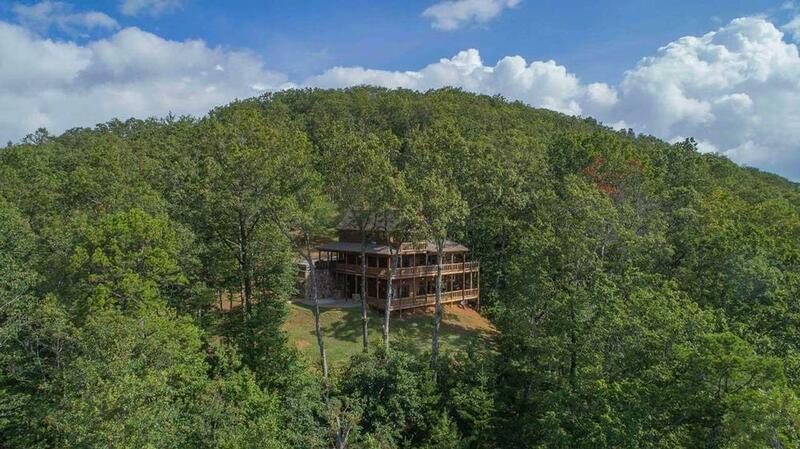 This secluded refuge is pure heaven for those looking for a comfortable, relaxing home away from home. You’ll have such a wonderful time you may want to hide away here forever. 01/19 - The cabin was exactly as described. The home was well maintained and clean upon arrival. The staff were very professional and polite throughout the process. 11/18 - Fantastic views and spacious home.Great company! I want to give a special thank you to Floyd, Property Manager on call. He was exceptional. I would highly recommend Escape to Blue Ridge to anyone. 11/18 - Roomy, warm, and the kitchen is really well equipped if you are cooking for a crowd. Very customer focused, great to work with. 10/18 - The cabin was clean, in a beautiful location, and there were no chiggers, scorpions, spiders, or other insects noted on our stay. That is remarkable considering that some pests are very difficult to get rid of when a home is in the middle of nature. 09/18 - Very clean, nicely decorated, great views, very private. 07/18 - I enjoyed the scenery and peacefulness this home had to offer. I really enjoyed this home and can't wait to come back next year. 06/18 - The game room was our main hang out playing pool, as well as the back porch! The view was stunning at any given point during the day! I love Escape to Blue Ridge. We recommend you to everyone! 05/18 - It was a very nice cabin. I’ve been to a few and this is the best so far. They keep this cabin up. The downstairs was the best, it had a little of everything for entertainment. I haven’t had any problems with Escape to Blue Ridge and will be coming back soon. 3/18 - Awesome home that was perfect for 10 college friends from 34 years ago to hang out. Outstanding company. 10/17- Enjoyed the privacy and the views. The reservation process was flawless. 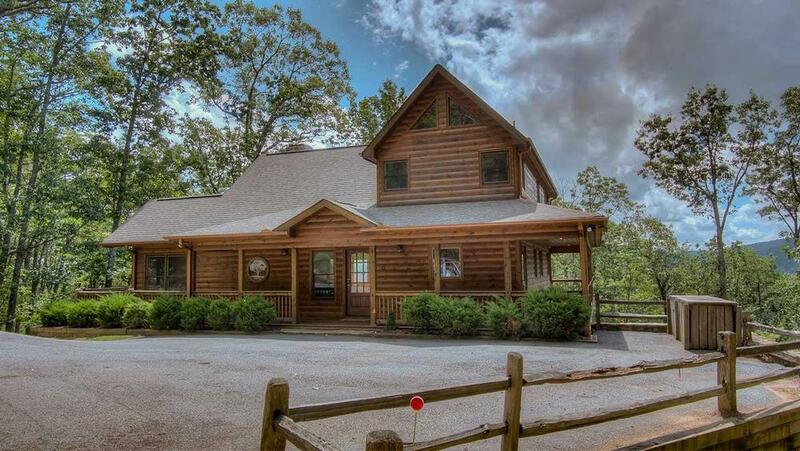 Kathy was very knowledgeable and listened to my needs to help find the perfect cabin. 08/17- The view was beautiful. This was a very spacious home. Very nice cabins and very nice staff! We had a problem during our stay and the staff/owner helped resolve it. Thank you. 06/17- Moonlight Lodge is lovely. It is well-appointed, clean, and comfortable. It is sufficiently large that each person could find their own nook to read or draw or chat with another family member without disturbing others. We all enjoyed rocking in the chairs on the back porch and taking in the exquisite view. Escape to Blue Ridge is a fabulous company, and we keep coming back (our 6th time). We are always impressed by the staff when making reservations or asking questions about properties. They are positive, informed, and helpful. The cleaning staff deserves mention as well. We have always been impressed with the condition of the cabin/lodge when we arrived. 11/16- The view was beautiful! The large kitchen table was nice. We have used Escape to Blue Ridge many times and are very happy with the company. 11/16- Very nice place - lots of attention to small details and amenities. The Fall view from the deck was tremendous! Excellent and professional company. 08/16- The kids loved the game room, the adults loved the hot tub. 07/16- I loved how open it was with kitchen and living area. Outstanding and very impressed with the whole organization. 04/16- I loved the cabin it was very peaceful with a nice view. 03/16- We loved the layout, the spaciousness, the view, the spacious eating area, the decor and wood everywhere, the fireplaces, the hot tub, the roomy bathrooms... loved the home! 02/16- The view!!! I have reserved at least 10 times different cabins through your organization. I have always been impressed by the views and the beauty of all the cabins I have stayed at. Plus the discount for returning customers and it is easy to choose a cabin, viewing and payment. Thank you for great customer service. See you in December!! 02/16- The home was beautiful. The view was stunning. We enjoyed the hot tub, the pool table and the spacious layout. When I booked Heavenly Hideaway the staff was EXTREMELY helpful! 01/16- The cabin was beautifully decorated and mostly newer furnishings. The hot tub preformed well.The kitchen was well stocked with everything we needed. 01/16- Great cabin feel and decor, very rustic..beautifully decorated. Wonderful, very accommodating to the customer. 12/15- Everything was very beautiful! Bedroom balcony was such nice feature. Loved every room and decors. Very professional company, always nice. Thank you for making our vacation special! We will again come back to blue ridge! 10/15- Beautiful cabin, tucked away in the mountains! We had an amazing vacation. We will be back! 09/15- Visted Blueridge for Labor Day weekend with my family. I was very impressed of how beautiful and clean the cabin was! I enjoyed my stay and would most likely return.I really liked that it was very easy to get a hold of someone for questions and information. Great communication! 08/15- The house is beautiful and we loved it. We were a group of 7 and were very comfortable. The beds were comfortable and clean, the sheets and towels were luxurious, as stated. At eye level, the house was immaculate but looking up at the high ceilings, the light fixtures, windows and trinkets on top of shelves in the kitchen, the house is in dire need of deep cleaning. We lost a day of using the hot tub as it was not working our first night there but loved it once it was repaired. 08/15- Nice location. Well designed home. 06/15- We enjoyed the location the best. The home was beautiful. I was very impressed with the company, hospitality an all . Previously, we've used a different cabin rental company and we were a little reluctant to try someone new. Between Facebook and online reviews made the decision easier. 06/15- Proximity to activities, seclusion. 12/14- Beautiful view, so convenient that the fire places were gas lit, comfortable beds and warm open floor plan. I had a wonderful experience not only with the Cabin itself, but with the staff that I interacted with prior to arrival. The home was as beautiful in person as it was in the pictures and my small group had a fantastic time, just relaxing, eating and enjoying each others company and the views. I would recommend Escape to Blue Ridge and the Heavenly Hideaway cabin again and again! Thank you! 11/14- The house was cozy and had great upgraded features. The kitchen was fully stocked and the living area had ample seating. 11/14- I enjoyed the fireplace, while the younger guests really liked the fire pit and the hot tub. My toddler grandson was especially fond of the wraparound porch, which he circled endlessly. Overall, we were pleased. The area is very scenic and peaceful (minus the construction nearby). There appeared to be a ladybug invasion on the upper level, screens, and porch--which delighted our 2-year-old but irritated my daughter and her husband. Also, there was a water outage Sunday and Monday, but it was eventually resolved. Nonetheless, we will return. 10/14- Beautiful setting; loved the bear toilet paper holder; nice seating area in living room. nice seating area off living room on main floor. 08/14- Our favorite features were the views, size and accommodations. Its was the first time my family and I have taken such a vacation and we loved it. The Blue Ridge are is beautiful and the Heavenly Hideaway cabin was perfect which made our stay that much pleasurable. We certainly look forward to our next trip there. My family and I (11 of us) stayed at the Heavenly Hideaway. As soon as we arrived at the location we all fell in love with the place. Beautiful cabin... we felt at home away from home. If we decide to come back in a big group again, we will definitely stay in the same cabin! Our experience from beginning (about 5 months ago when we reserve the cabin) to the moment we left was perfect. The ease in which everything was setup for us to reserve, arrive and leave from the cabin was excellent. Could have not asked for a better experience. We will definitely come back! Thank you!